Anderson coach Danny Neal presents Kate Hill with the winners trophy after her victory in the Anderson University Invitational. 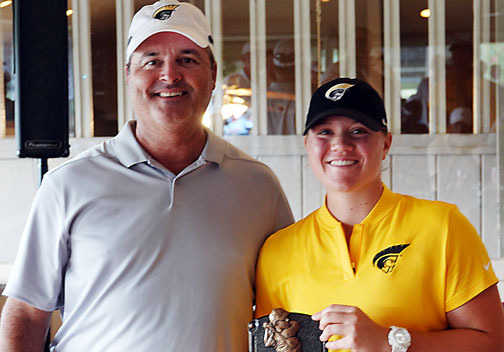 Kate Hill had a couple of reasons to celebrate after the final round of the Anderson University Invitational at Cobb’s Glen Country Club. Hill, from nearby Clemson, won her first college tournament and as a bonus her final round 4-under par 68 set a new school record for lowest tournament round. The Trojan junior trailed first round leader Anna Parramore from Erskine by five shots. Her first round 7-over par 79 left her in a tie for eighth place. “I knew I had to make up some ground,” said Hill. “I had a chip in birdie from the fairway on number nine and made a 20 foot birdie putt on ten to help pick up some shots,” she said. In the opening round, the 18th hole turned out to account for more than half of the strokes Hill was over par. She carded an 8 on the hole, but got a shot back in the final round with a birdie. “I was able to slow things down and just play some good golf. My best round ever was a 67 and I was aiming to shoot that number. 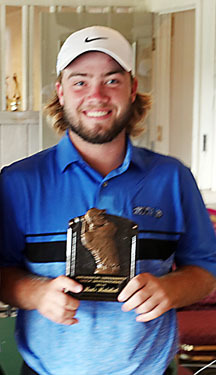 I didn’t realize I was setting a record, but it was great to do that and get my first college win,” said the Anderson golfer who won the Green Jacket Junior tournament on the same course when in high school. 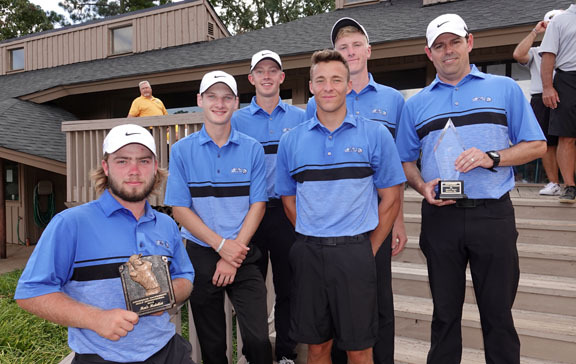 Anderson won the team title for the second straight year at their Invitational. 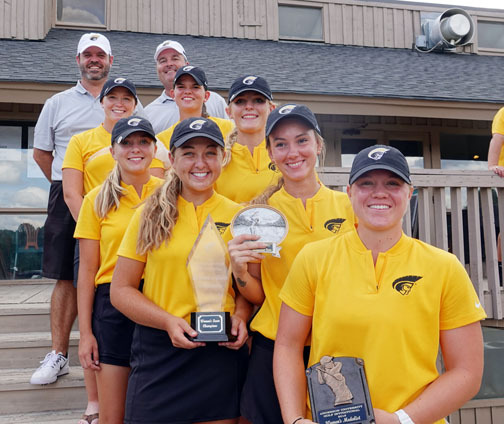 Team members included medalist Kate Hill, Anna Freeman, Tiffany Elam, Kerington Lamb, Victoria Hall, Makalyn Poole, Samantha Ellison and coaches Danny Neal and Denton Moore. Hill finished two shots in front of her teammate Anna Freeman. Tiffany Elam finished third while Kerington Lamb was fourth as Trojans filled up the top of the leader board. “Our entire team played well both days,” said Anderson coach Danny Neal. “We have some high expectations for this year and getting off to a good start with the win was important for our confidence,” he said. Neal has seven players on this year’s team who can each contribute to the Trojans success. In addition to the top four golfers freshman Victoria Hall finished ninth. Individual entrants Makalyn Poole tied for tenth and Samatha Ellison earned a top-25 finish. “We have good depth and the right number of players on the team that I like. We think we can be a top-20 team this year,” said the Trojan’s coach. This was the second straight win in the AU Invitational for the home team. Catawba finished second 38 shots behind Anderson, while Converse College finished in third place. 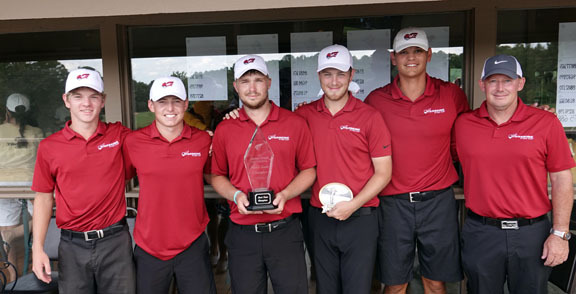 Erskine won the Anderson University Invitational at Cobb’s Glen. The Flying Fleet team included Zach McLain, Callum Watson, Jonathan Costello, Tyler Jones, Stokes Brownlee and coach Jason Allen. Erskine held a one shot lead after the first round and pulled away from the field with a final round 291 to win the men’s team championship by two shots over Southern Wesleyan at the AU Invitational. The Flying Fleet improved by 7-shots in the second round to take the championship trophy back to Due West. “We got off to a good start, but we dropped a few shots on the way in,” said Erskine coach Jason Allen. “We played well for the first tournament of the year,” he said. Defending Conference Carolinas individual champion Eric Shea shot a final round 6-under par 66 to win the Anderson Invitational. The Fleet was led by Zach McLain who shot rounds of 74-69 for a 143 total and a runner-up finish. Callum Watson finished in a tie for third with Jonathan Costello in sixth while Tyler Jones tied for ninth and Stokes Brownlee tied for 11th. “We have a team that I think is capable of making the regionals this year. We are in the toughest region in the country with USC Aiken, Limestone and the Florida teams, but if we can keep playing well and make the regionals anything can happen,” said Allen. Eric Shea picked up right where he left off last season. The 2018 Conference Carolinas individual champion posted a final round 6-under par 66 to make up three shots and win the mens’ title. The Warrior golfer from Canada trailed first round leader Jake Miller from Anderson after the opening round. Miller shot a 2-under par 70. The Warrior’s junior was tied with another Anderson golfer, Colt Martin for second. “I’m more excited to get this win coming from behind because it gives me a lot of confidence I can make things happen,” he said. “Starting the year with a win is a great way to get going,” he said. Shea could have gone even lower. At one point in the round he was at 7-under par before giving back a couple of shots with a three-putt on number 18. Southern Wesleyan was the runner-up at the AU Invitational. Team members included medalist Eric Shea,Severin Anfindson, Noah Mullens, Ty Campbell, Thomas Nielsen and coach Joey Maxon. “Eric was really impressive the way he played today. He got off to a good start and helped us move up,” said Maxon. The Warriors shot the best team round of the event firing an even par 288 total to jump ahead of Anderson and finish as the second place team. “We are kind of stuck in second. We finished second here before. We are getting closer,” joked Maxon.